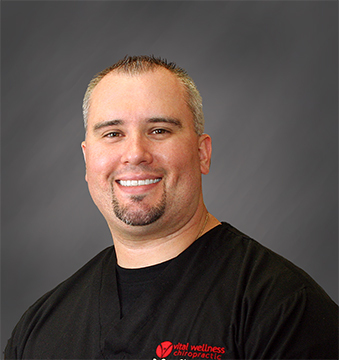 Sioux City, IA Chiropractor - Dr. Sean Chartier, D.C.
A Siouxland native, Dr. Sean Chartier, D.C., has been practicing since 2004. He’s a graduate of Morningside College with a Bachelor of Science degree in Biology/Chemistry. He then earned his Doctor of Chiropractic degree from Northwestern Health Services University. Using his expertise in the biomechanics of the human frame, understanding of joint dysfunction, and integration of state-of-the-art technology, such as the ProAdjuster and Posture Pro. Dr. Chartier specializes in spinal analysis, soft tissue mobilization and individual posture improvement. In addition, he’s certified in Chiropractic Acupuncture and licensed in the Graston Technique for soft tissue repair. A former standout in competitive swimming, Dr. Chartier understands the rigors of training, importance of nutrition, and stress of competition. He’s willing to go the extra mile to help all patients get well and stay well. If you are suffering from trauma due to an accident, sports, or work related injury or want to maintain optimal health and wellness, Dr. Chartier can help you.